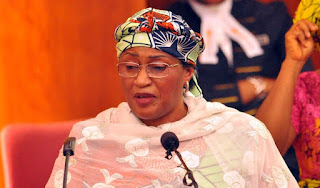 Fate, it would seem, averted a major catastrophe on August 18, when the Minister of Women Affairs and Social Investment, Senator Jummai Aisha Alhassan escaped unhurt in Takum Local Government Area of Taraba State, where her convoy was attacked and the rear windscreen of two of her vehicles shattered. The minister was in Takum to monitor the state assembly bye-election to fill the vacant seat previously occupied by Mr Hosea Ibi, who was kidnapped and later killed early this year. According to Alhassan, she was on her way to one of the polling units when her convoy was attacked by people riding in a government-owned Hilux van, who started hurling stones at the vehicles in the convoy, and in the process shattered the rear windscreen of the SUV conveying her and the state chairman of the party, Mr Abdulmumini Vakki. Alhassan alleged that the thugs who attacked her were brought in by the state government; but disclosed that no one was hurt in the attack. Noting that Ishaku is a democrat who believes that election is the vehicle for political recruitment, Dan Abu said the governor would not stoop so low as to recruit hoodlums to attack the minister for any reason as he sees the minister as no threat to his victory in his home town and considers her as a sister. His words: “The governor sees the minister as a sister and does not have to resort to violence at all, which is not in his character anyway, as he is guaranteed overwhelming victory. Mind you that this is the governor’s home town and you don’t expect any other party to hold sway here. “That is why the allegation by the minister is so absurd, unnecessary, malicious, unfounded and simply cannot be substantiated. Why would the governor stoop so low as to have her attacked? Even in 2015 when the duo slugged it out for the number one seat in the state, he didn’t have her attacked anywhere. Is it now in his home town, over a mere state assembly slot that the governor would now have her attacked? To what end? “Information at our disposal shows that she was attacked by her own people. We gathered reliably that the minister hired a crowd from the neighbouring states into Takum for her rally. At the end of the day, she failed to pay them the agreed amount of money and so they became agitated and attacked her. But the minister who had previously spoken with Sunday Sun, said that she got wind of plans by the state government to bring in thugs and had informed the Commissioner of Police in the state, David Akinremi, who promised to make sure that adequate care was taken to forestall any breach of security. She described the attack on her as a frustrated attempt by the government as a result of the rousing welcome she received in the governor’s home town and the related rejection that the governor is having to put up with from his people. “My convoy was attacked by thugs hired by the Taraba State government. These thugs were brought in from Wukari, Bali and Jalingo, just to cause confusion when the governor saw clearly that his people had rejected him in his hometown and had given me and my people a rousing welcome and continued to cheer us wherever we went. “My joy is that even though there was a large crowd there cheering us, nobody was hurt, despite that they shattered the rear windscreens of two of my vehicles. More so, this was an attack by aliens because the people on ground here have shown overwhelming acceptance for me, but the state governor has been openly disgraced by his own people, in his own town,” she said. A chieftain of the All Progressives Congress, who wishes not to be named in print, and a native of Takum told our correspondent that the claims by the state government were at best preposterous. “I would not want to join issues here because of personal reasons but for the state government to claim that the minister was attacked by her own people is ridiculous. Unlike the governor who is my brother, the minister is very generous and gives money to her followers freely. If anyone would be attacked for being stingy, then it should be the governor. Even his own cabinet members are complaining. The minister came in on Thursday, two days before the election and was highly received. People were trooping to her house to eat and celebrate ahead of the election. It is simply not possible to think that she was attacked by her people or even the people of Takum,” the chieftain said. While the governor and minister trade blames, the important questions that have remained unanswered are: who really attacked Senator Aisha Alhassan in Takum? What could have motivated the attack by government as the minister alleged? Or was the entire scene stage managed for political reasons of some sort? Senator Alhassan contested against Governor Ishaku in the 2015 general elections for the governorship of the state and emerged the closest rival. She challenged the governor’s victory up to the Supreme Court, where she lost. Many people consider the duo as leading political rivals in the state. Incidentally, Taraba State is highly polarized along ethno-religious lines and the duo of Ishaku and Alhassan are constantly not on the same page. While Alhassan is a Muslim from Jalingo Local Government, Ishaku is a Christian and a Jukum man from Takum Local Government Area of the state, where Alhassan was attacked. Ishaku has consistently insisted that he needs peace in order to provide the much needed development in the state. Since the inception of his administration, the hitherto widespread communal clashes in the state have reduced drastically, and now replaced by the crisis caused by Fulani killer herdsmen and the emerging trend of kidnapping and juvenile violence, especially in Jalingo town. While Alhassan is the leader of the APC opposition party in the state, Ishaku is leader of the PDP, which made the battle to win the Takum 1 state constituency seat in the bye-election therefore a litmus test for 2019. People of Takum have over the years given ardent support to and voted for the PDP since the return to civilian rule in 1999. It, therefore, seems reasonable that the possibility of the predominantly pro-PDP fans in the local government attacking the minister for intruding on their turf cannot be overruled. A PDP chieftain who pleaded anonymity told Sunday Sun: “The senator is a known Muslim and so the predominantly Christian population in Takum would see a victory by the candidate of the opposition APC, who is loyal to Alhassan as a slap on the community. Again, it could be that some religious fanatics had attacked her to disgrace her when it seemed her presence could influence the election to her favour. “Being an opposition party figurehead, the tendency of some political fanatics attacking the minister to stop her from further influencing the people to her favour against the governor and the ruling PDP is not unimaginable,” he said. An another Taraba indigene, Danladi Baba, condemned both the attack on the minister and her claims that the incident was orchestrated by the state government given that it took place in Takum, the governor’s hometown, and which is not an APC stronghold. “I personally condemn the attack on the minister because that could have easily led to lose of lives, it is not acceptable. Besides, she is a national figure from our dear state and so we owe her all the respect that is due to her, both as an indigene of this state and a minister of the Federal Republic. But General A. T. Ibrahim (Rtd), a stakeholder in the state, however, believes very strongly that the governor was behind the attack on the minister. He said that the people of Takum had already shown their overwhelming acceptance of Mama Taraba, Senator Alhassan, when they trooped out to welcome her when she arrived Takum for the APC rally ahead of the election. “We came into Takum on Thursday with Mama Taraba and you need to see the crowd that welcomed us. We had been on ground and moving around since that day; so it is terribly wrong for anyone to claim that the baseless attack on the minister was carried out by religious, tribal or sectional bigots. “We got the information that the governor had brought in thugs from Bali, Wukari and Jalingo. We reported this to the police. It was this same thugs who were imported into Takum that attacked her. It had nothing to do with the people on ground who had shown their preference for her against their own son who had failed them,” Ibrahim said. Yakubu Amadu, who hinted that the attack could have originated from elements within the government desirous to impress the governor, however, blamed the minister for stepping on a lion’s tail. “I cannot deny that the government had a hand in the attack. It is possible. But I personally blame Aisha for it. Thank God that no life was lost but if there was bloodshed, it would have been on her hands. How can she expect to come and beat the governor in his hometown? This is the governor’s state constituency, where he also cast his vote and you want to defeat him here. That is taking the joke too far,” Amadu said. As the situation stands today, the desire of everyone is that the police would conduct diligent investigation to unmask the people who masterminded the attack on the minister. Moreover, the incident places moral obligation on politicians to play by the rules political decorum as the country heads for the 2019 elections.